When I travel, I always have this driving force behind that wills me on to go where people normally don’t for one reason or another. 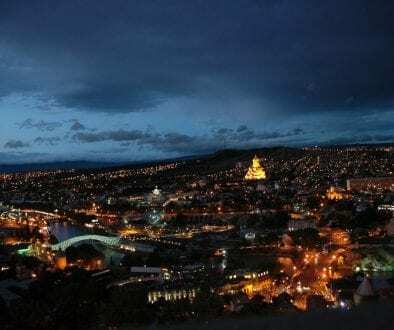 The thirst for knowledge and curiosity for the unknown are the main forces that are pushing me to keep doing this and could be your key ingredient to visiting Armenia. When it comes to its formation and geographical history, Armenia has had a rough past. The Greeks, Romans, and Ottomans have all at one time, or another owned this small piece of land. However, since its declaration of independence in 1918, Armenia has been proudly standing on its own. Yerevan has only one airport: Zvartnots International Airport, located 12 km outside of the city. Unfortunately, there aren’t any public transport options leading to the city so the only way to get out of it is via taxi or rent a car. A ride to the city center will cost roughly 6,000 drams ($10 euros). Once you settle, don’t expect to cover Yerevan in a day. The city is home to more than one million people and covers roughly 230 square kilometers. You can try to discover Yerevan in 48 hours (0r so) but it’s far better to stay at least a few days to see as much as possible. In such a big city, the location is incredibly important because getting to places can be more time-consuming than the actual sightseeing. And one of the best locations in the center of the capital is the Armenia Marriott Hotel Yerevan which is not too far from most of the interesting sites in the city. With that being said, let’s see which are the 10 must-see places in Yerevan you really shouldn’t miss while visiting. If you’re traveling around the Caucasus, you should also check my guide about visiting Georgia or my list of favorite things you can only do in Georgia. The Matenadaran is the world’s richest source of medieval manuscripts. The written history and development of humankind is detailed in these manuscripts as well as the very early printed books. The subjects are very varied with arts, literature, medicine, philosophy, history, religion and the very early mapping techniques. The building itself is very domineering with matte gray stone being used to create a very tall and wide stature. Many of the manuscripts date far back over 1,000 years which is incredible seeing as the pieces on show are in a very good condition. You can really get a sense of what were the key areas of concern for the people back in the medieval times when you read the detailed explanations of certain manuscripts. The Republic Square is located in the center of the city, surrounded by 7 major tourist sights. The square covers staggering 30,000 square meters and you can literally spend a whole day here. The square hosts some of the most impressive landmarks in the city, such as the National Gallery, the History Museum, the Government, and even the fantastic musical fountains. One fun fact about it is that it took Armenians more than 50 years to complete this impressive square. Yerevan is a very old city with a rich history and one great way to learn about it are its museums. If you read my articles, you know I don’t talk about museums that much but Yerevan certainly has a few seriously worth visiting. One is the National Museum of history that has more than 400,000 artifacts! I can comfortably say that this is the place where you can learn the most about not only Yerevan but Armenia as a country. Many people tend to forget the horrible Armenian genocide during WWI caused by the Ottomans. At the time Armenia was still under an Ottoman rule and in just two years (1915-1917) the Turks killed more than 1.5 million people, which almost half of the country’s population and thousands of Armenians fled across the world in horror. There’s no better place to learn about this dark era of Armenian history than the Tsitsernakaberd: the Armenian Genocide Memorial. Yerevan has a lot of parks spread across the city where you can sit back, relax, and have a picnic. However, the two that left the strongest impression on me were Lovers Park and English Park. Lovers Park was recently transformed and today features a traditional Japanese landscape. It’s by far the most popular park in the city and seems to be the oldest one as well. English Park is another very interesting place, interestingly, located on Italy Street. This is the biggest park in the city, covering almost 6 hectares of greenery. The Cascade is a giant stairwell that was built in 1971 and completely renovated in 2009. Today, the Cascade is one of the key landmarks of the city that offers the most iconic view of Yerevan. This monument has over 700 steps and eight levels, out of which every next one has different monuments, fountains, and even gardens. If you’re feeling lazy and 700 steps are just too much, don’t worry, you can use some of the elevators. Additionally, every last Friday of the month, Karin, a local folk dance group organizes FREE traditional dance lessons just outside of the Cascade. Sitting on the top of the hill, the Erebuni Fortress is one of the oldest sites in Yerevan, dating back to 782 BC, when the city was founded. It was one of the several fortresses erected in order to protect the borders of the ancient Urartu Kingdom. Successive Urartian kings chose Erebuni as a place of their residence and despite the numerous bloody invasions, the city surrounding the fort remained constantly inhabited. Obviously, this is a place full of history, one you mustn’t miss out on when visiting Yerevan. The Victory Park was built in Yerevan in 1950 to celebrate the end of WWII. Interestingly, the park initially featured a big statue of Joseph Stalin. However, after hid dead Stalin’s statue was replaced with an even bigger statue, known as Mother Armenia. This symbolized Armenia’s distantiation from the Soviet Union and the statue is a really important piece of the Armenian national identity. Mother Armenia is 50 meters tall and she has a sword in her hand, constantly watching over Armenia’s capital. Next to her, you will find The Grave of the Unknown Soldier, devoted to the eternal memory of the soldiers who died in the WWII and the Nagorno-Karabakh War. The Blue Mosque is the only surviving mosque in Yerevan. It was built in the 18th century when Armenia was still a part of Persia. That’s why the mosque is built in predominately Persian style. Before the Russian invasion, Yerevan had 10 mosques. However, after Armenia became a part of the Russian Empire the only one that survived was the Blue Mosque. The only reason for this is because it served as the official Museum of Yerevan from 1931 to 1999. If you’re traveling around this region, you should also check out my article about traveling in Turkey. In Armenia, you will find a lot of old churches, as the country was one of the first on to accept Christianity. However, St. Gregory is a fascinating piece of architecture and the biggest cathedral in Armenia and has a great historical significance. The cathedral houses the relics of St. Gregory, who was the founder of Christianity in Armenia. This cathedral is so massive that it has three churches within. One is the main church, and the other two are the chapels of St. Tiridates the King and St. Ashken the Queen. This also has a symbolic meaning because Tiridates and Ashken were champions of Christianity and the greatest supporters of St. Gregory. Even more impressive, the cross on the top of the church is 54 meters from the ground, which makes it visible from every part of Yerevan. The cathedral also has 30 arches and enough room to accommodate 1,700 people at a time. Just outside of Yerevan, you will find Geghard, another old and spectacular monastery, protected by UNESCO. Geghard is literally carved into the rocks and is a perfect demonstration of the stunning medieval Armenian architecture. The main chapel in the monastery was built in the 1200s’ but the complex was founded in the 4th century. If you want to explore the surroundings of Yerevan, this place would be a perfect opportunity for a one-day trip. If you happen to visit Armenia in July, you have to try this holiday. Vardavar is an Armenian pagan holiday where people go out in the streets with buckets of water, looking for victims to splash. People of all age group participate in this event, which makes it even more fun! I hope this article will inspire you to visit this wonderful city. Have you ever been to Yerevan or have places you thought I missed to mention in this list? Let me know in the comments below. Great article.The pictures are very amazing . The content is perfect. Thanks for sharing such an informative post. Wow- when you say you like to explore off the beaten path locations- you weren’t kidding! I didn’t even know this city existed until I read your post- but it’s absolutely gorgeous! It does look like you would need more than a day, or even two, to fully explore! Thanks, An. I’m glad you liked it. Indeed, it’s a refreshing and interesting thing to experience, Gonca. I hope you try it out one day. That’s why it’s called pink city, learned something about the city, The colors of the rocks are amazing. Great pictures too of the Yerevan. Armenia looks gorgeous! I love how it seems to be a mix of different cultures. European and middle eastern. The architecture is also very impressive! Would love to see some of the churches in person! It looks so incredibly interesting! I would love to visit Yerevan one day. Thanks for your tips in this article, I’m definitely coming back here before I plan my trip. Thank you, Zenja- I really appreciate it. Thanks for this informative post. I have never been about the Pink city in the Caucans before. The summer festival looks a lot of fun but what do they celebrate? That’s an interesting question. Initially, the ancient festival was associated with the goddess of water, beauty, love, and fertility, Astghik. However, nowadays the festival is more closely tied to the transfiguration of Jesus (as the main religion in Armenia today is Orthodox Christianity). the colours and sights are simply spectacular. Armenia is somewhere we have yet to explore and this is a great guide. Your depiction of the destination has enchanted me. I have to visit Armenia soon. Wow, I had no idea Armenia was so beautiful with much to see and explore! And the tradition of Vardavar reminds me of a similar one we have in India called Holi, where the water thrown at random people is coloured! oh wow!! I didn’t know this country was that beautiful!!! Putting this one in my bucket list now!! Also I´ve heard that the food from there is amazing!! Such a fascinating place with such a rich history! You’ve absolutely captured the spirit in your photographs also. Sounds amazing and the architecture is stunning! This looks like such a beautiful place! Great tips for anyone planning a trip who wants to know what they can’t miss. Great shots clicked. Vardavar is similar to Holi event in India. Only difference is Holi is played with colors. Very detailed guide to sightseeing in Yerevan – bookmarked it for future! St. Gregory looks like a building from future, I love it! Such a beautiful place to visit. I’m sure there not much material around about this country which makes your article all the more useful. Armenia is a country that has somewhat slipped under the radar for us – we hadn’t really considered it before. 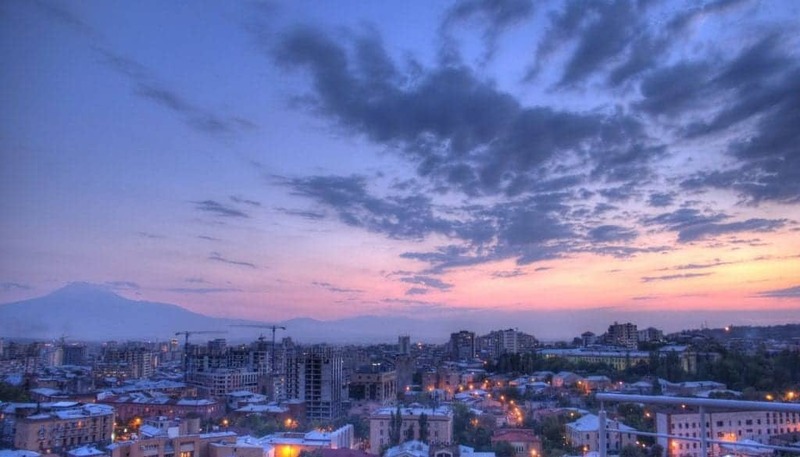 Yerevan really looks stunning though, your photos are fantastic! This gives us something else to consider for our Euro trip next year! Thanks, Alex! Yup, Armenia remains under the radar for most people for some reason but visiting is absolutely worth it! I saw a video about Yerevan a few months ago, but now I totally fell in love! Thanks for sharing this wonderful place, your photos are so beautiful.A fantastic place and not so well known. Never saw referring to Yerevan as a pink city. But this makes it much more interesting. during my travels, I photograph the streets a lot and the color would be a nice addition. Here in Dubai, many people go to Yerevan and I too want to go there as it is a very short flight from here. I loved your detailed post on this pink city. Varadvar festival looks fun and it is similar to Holi in India where people throw a bucket of water on all people who are roaming around. You always introduce us to unusual places, Daniel. I’ve thought about Armenia before but haven’t done much research into it. You’ve got my intrigued, I think I need to look into it a bit more. This is a great guide, thanks for sharing. I had just heard about Yerevan but looking at your pictures now it would definitely feature in my bucketlist. Would love to visit Yerevan! What a beautiful place. I know a little about Armenian history and I’ve always wanted to visit, but I knew nothing of Yerevan. Thanks to this brilliant guide now I do, and I really want to go! This article gave me a totally different view and outlook on Armenia. What a beautiful country, I would love to visit someday. Armenia is so beautiful and yet so underrated. It’s a small country with everything in it especially the mixture of cultures and the gorgeous landscapes. Best thing about it is it is cheap too. I believe that these former Soviet republics are some of the last unexplored and not over-touristy places in the world. And some of them – as you prove in your post – are truly hidden gems. I think one of my next trips will include this part of the Caucasus. Very inspiring post! Thank you, Renata- I’m really glad to hear that this article inspired you to visit the Caucasus region. Geghard looks like a place you would see in movies. So cool, I would love to visit just for that place alone. Yerevan looks amazing and thank you for sharing top places to visit while there. This city is gorgeous! I shamefully had no idea it existed and I learned so much thanks to your post about Armenian history. Great discovery! Yerevan looks like an amazing city with great architecture. I had no idea Yerevan has a blue mosque as well and Vardavar looks like an exciting thing to do there, loosen up and have some bit of fun with water. I would definitely include this on my travel wishlists! The photos look amazing, and captures the destination itself. Thanks a lot for sharing this to us! Thanks for your great advice in Yerevan city. I have been there this Autumn and looks like I have visited about half of your recommendations. Did you visit Geghard by public bus or how did you reach it? I would add if someone is already in that area not to skip Garni and it is even possible to make ~10 kilometers hike between Garni and Geghard. Also my favorite thing in Yerevan for breakfast or dessert were ponchiks (sweet buns with different stuff inside). I ate them at Grand candy shop in Yerevan, near the Cascades. Looks like they have many shops around the town. Check this out – https://nomadjoseph.com/best-ponchiks-donuts-in-yerevan-grand-candy/ . Hope to visit this lovely city again and see other places which you have recommended.